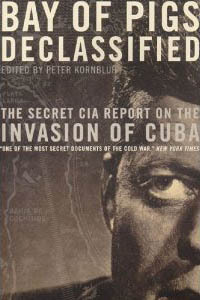 Washington, D.C., August 1, 2011 – Pursuant to a FOIA lawsuit filed by the National Security Archive on the 50th anniversary of the infamous CIA-led invasion of Cuba, the CIA has released four volumes of its Official History of the Bay of Pigs Operation. The Archive today posted volume 2, "Participation in the Conduct of Foreign Policy" which contains detailed information on the CIA's negotiations with Guatemala, Nicaragua, Panama and Great Britain on support for the invasion. "These are the last remaining secret records of U.S. aggression against Cuba," noted Peter Kornbluh, who directs the Cuba Documentation Project at the Archive. "The CIA has finally seen the wisdom of letting the public scrutinize this major debacle in the covert history of U.S. foreign policy." Kornbluh noted that the agency was "still refusing to release volume 5 of its official history." Volume 5 is a rebuttal to the stinging CIA's Inspector General's report, done in the immediate aftermath of the paramilitary assault, which held CIA officials accountable for a wide variety of mistakes, miscalculations and deceptions that characterized the failed invasion. The National Security Archive obtained the declassification of the ultra-secret Inspector General's report in 1998. Volume 2 provides new details on the negotiations and tensions with other countries, including Great Britain, which the CIA needed to provide logistical and infrastructure support for the invasion preparations. The volume describes Kennedy Administration efforts to sustain the cooperation of Guatemala, where the main CIA-led exile brigade force was trained, as well as the deals made with Anastacio Somoza to gain Nicaragua's support for the invasion. Volume 3 of the Official History was previously declassified under the Kennedy Assassination Record Act. The Archive will post a detailed assessment of the declassified history, along with two other volumes tomorrow.